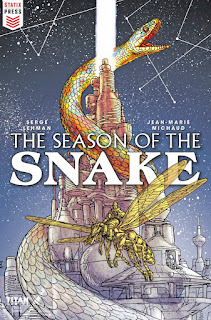 This volume is a hefty story translated from the original French version, and The Season of the Snake is an impressive science fiction mashup of wild concepts, a futuristic society, a star-spanning travel system, strange alien races, a dash of superheroics and a new host learning the system. The result is a Mobius-influenced story (written by Serge Lehman) that will challenge the reader to sort out the concepts presented - but the rewards are great. The art by Jean-Marie Michaud is wonderful, loaded with visuals that manage to be realistic and fanciful. The story makes clever use of color, reflecting the emotions (and stability) of the subject. It's not an easy read, but it's a terrific piece of work and well worth tracking down.